An emaciated deer that wouldn't flee from a barking dog or two gunshots fired by its owner in Pontotoc County tested positive. The landowner shot and killed the deer, a young buck, after it wouldn't leave following the two initial gunshots. State officials called to the scene removed the deer for testing. Two initial tests at the Mississippi Veterinary and Diagnostic Lab in Pearl were positive for CWD; a third test sent to the National Veterinary Sciences Laboratory in Iowa also was positive. The incident happened Oct. 8 and the results from Iowa were received the last week of October. Pontotoc County is in northeast Mississippi. State officials implemented its CWD protocol that will involve testing tissue samples of deer killed by hunters. Unlike with the previous CWD-positive deer found in southeast Mississippi, officials won't do active shooting operations of other deer within the CWD zone for testing. Fourteen locations in Mississippi have been provided for hunters to put deer heads into freezers for testing. Four more locations will be added in Pontotoc County near where the positive deer was found. With this second deer testing postive just 50 miles from the state border, officials with the Alabama Department of Conservation and Natural Resources are on alert and have been communicating with hunters about the disease. The agency's Wildlife and Freshwater Fisheries Division has tested almost 8,000 deer since 2002 with no positive tests for CWD. As part of the division's CWD Strategic Surveillance and Response Plan, it will increase CWD surveillance sampling efforts beyond typical surveillance rates in Franklin, Lamar and Marion counties. 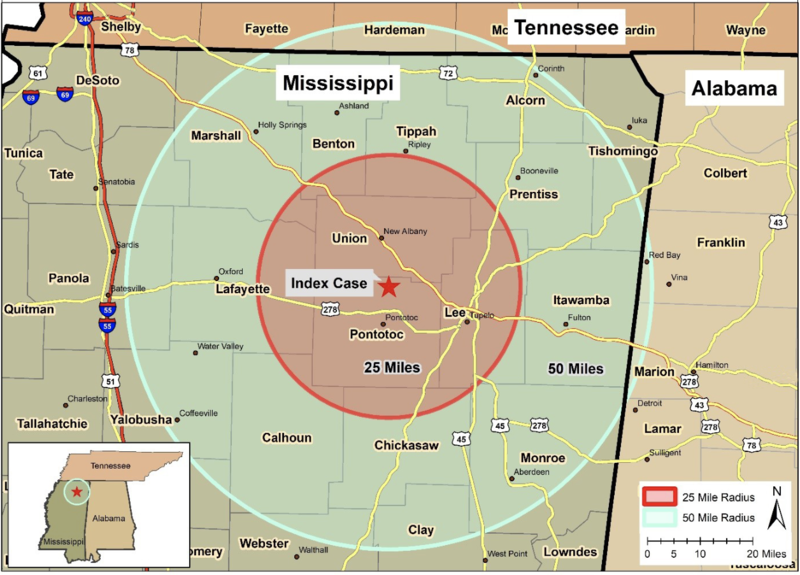 These three counties are within 50 miles of where the Pontotoc County deer was discovered. Alabama officials will use samples from voluntarily submitted hunter-killed deer, road kills and any abnormally behaving deer. Deer infected with CWD can spread the disease to other deer even before symptoms develop. It can take one to two years for infected animals to become symptomatic. When symptoms appear, they can include emaciation, lethargy, abnormal behavior and loss of bodily functions. Other signs include excessive salivation, loss of appetite, progressive weight loss, excessive thirst and urination and drooping head/ears.